Certified nursing assistants in Hawaii earned an average income of $15,000, in December 2014, as per indeed.com. It was 38% lower than the average CNA salaries for job postings throughout the nation. 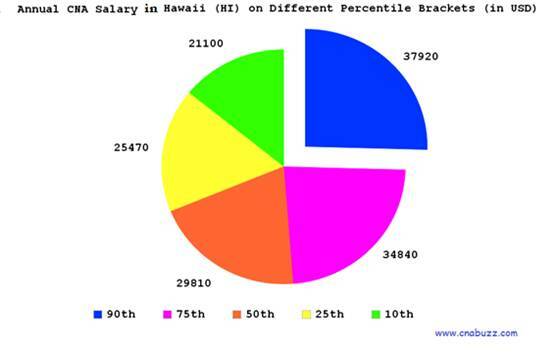 According to the reports of BLS, the annual and hourly mean salary in HI in May 2013 was $29,780 and $14.32, respectively. At that time, the state employed 5,390 CNAs. Employment per 1,000 jobs was predicted to be 0.83. 90% of CNAs made less than $37,920; 10% made more than $37,920. 75% earned less than $34,840; the remaining 25% earned more than $34,840. 50% were offered less than $29,810; the rest of 50% offered more than $29,810. 25% of CNAs were paid annual wages less than $25,470; 75% were paid more than $25,470. 10% of employees salaried less than $21,100; 90% were salaried more than $21,100. CNA salary does not fluctuate much in the state of Hawaii at different geographical location. Except Hilo and Kahului, all the cities in Hawaii offered median annual salary of $33,323 and median hourly salary of $16 to the nursing assistants as per the figures provided by salary.com. CNAs have the opportunity to hold multiple job titles, which depend on numerous factors, such as education, industry, and experience. The better position a nurse aide holds the better salary s/he earns. In December 2014, CNA Hospice made $19,000, followed by Medical Assistant Family Practice and CNA Rrmc, who earned $18,000 each. CNA Medical Surgical was paid $17,000. The income of other job titles fluctuated from $9,000 to $16,000. The demand of CNAs is rapidly increasing day by day all across the world. As per the data provided by the U.S. Bureau of Labor Statistics, the job requirements for certified nursing aides are likely to increase by 2022, as compared to other occupations. Some of the major reasons that might speed up the demand of nurses in the upcoming years include disease breakouts, disasters, and accidents. Question 1 – I wanted to know the starting salary for CNA in Hawaii. Answer – Since the cost of living is high in the state of Hawaii, the starting salary is around $17K. Question 2 – Can anyone suggest me whether it is better to work in a hospital or at home health? Answer – It is better to work in a hospital, as the starting salary is comparatively more.